The Spotted Owls at Miller Canyon were a miss yet again, but like any good birders, we had a contingency plan in Patagonia. Sure, there are some other famous Patagonias in the world, but nine out of ten birders agree that Arizona's is the best. 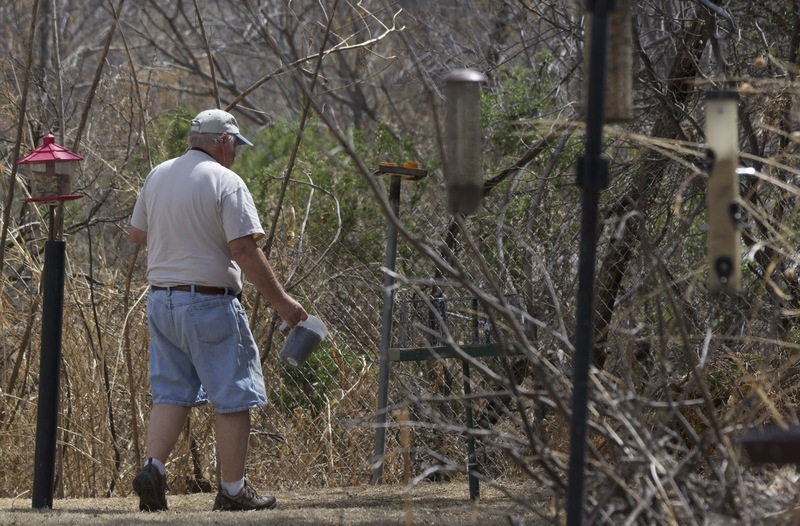 By heading southwest and then looping back up towards the Santa Ritas, we'd be able to spend several hours in this veritable birding mecca of southern Arizona, and that's really saying something for the area. 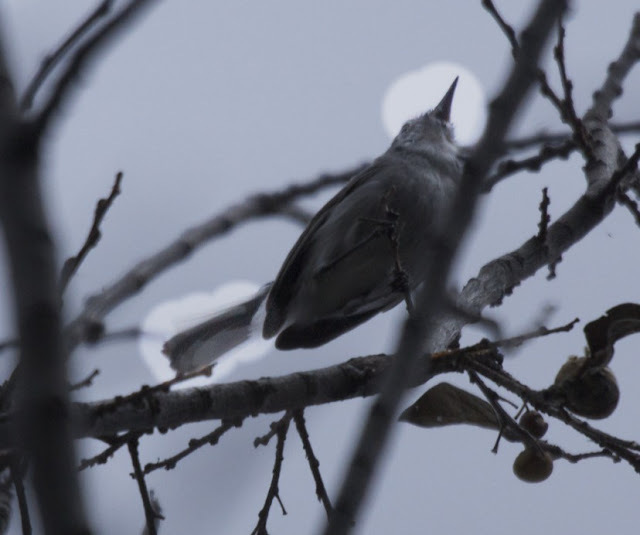 We hoped to find a lifer Black-capped Gnatcatcher at Patagonia State Park, as well as the wintering Trogon that has been returning to parts of the Sonoita Creek off and on since the late 1990s. But before any of that we had to stop by and pay our respects to the Paton House, one of Arizona's birding landmarks. For the last half-century this property has been maintained with its many feeders and bird attractions, providing some excellent, at-ease birding for those staying in town or just passing through. 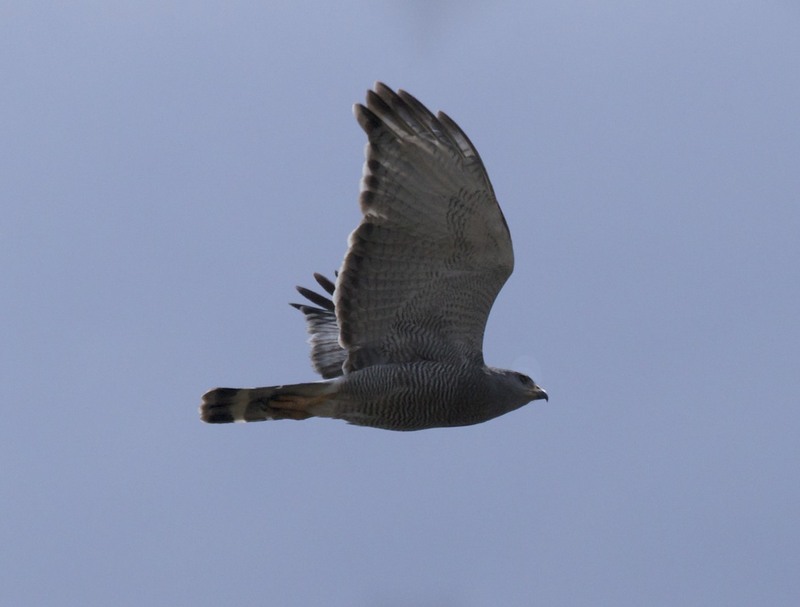 The current caretaker, Larry Morgan, is also a very knowledgable, experienced birder and is often flush with up-to-date information on recent sightings in the area. 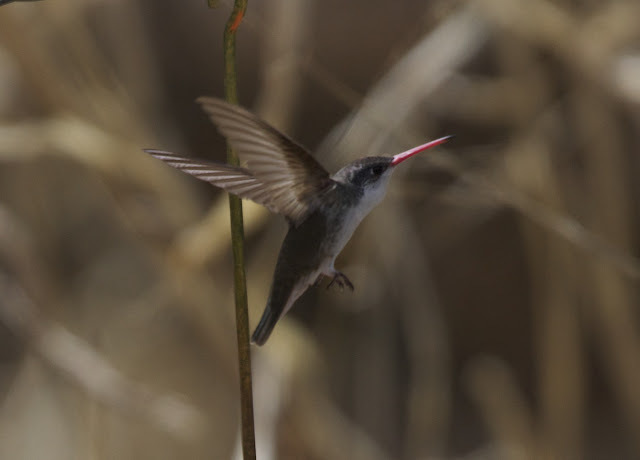 We missed the Scott's Orioles by only a couple of minutes, but had some brief, satisfying views of the Paton House speciality Violet-crowned Hummingbird, which has been reliably found here for the past several years. These white-fronted Hummers turn up elsewhere down south, but nowhere is so reliable for them as the Paton place. Missing the Scott's Orioles still puts me in the peculiar position of having only seen Orchard Oriole in Arizona for the 2013 year. That is rather backwards and shall have to be remedied directly. After a thirty-minute stake-out at Paton's, we proceeded towards Patagonia State Park, keeping all of our various sensors peeled--eyes, ears, noses, radar, potatoes, etc--and it paid off when we had a promising silhouette fly over the car and a nearby butte off the Highway 82. In hopes that the raptor would circle around, we pulled over to the side of the road, parking on the wrong side with doors hanging open and all concern for safety hanging with them. 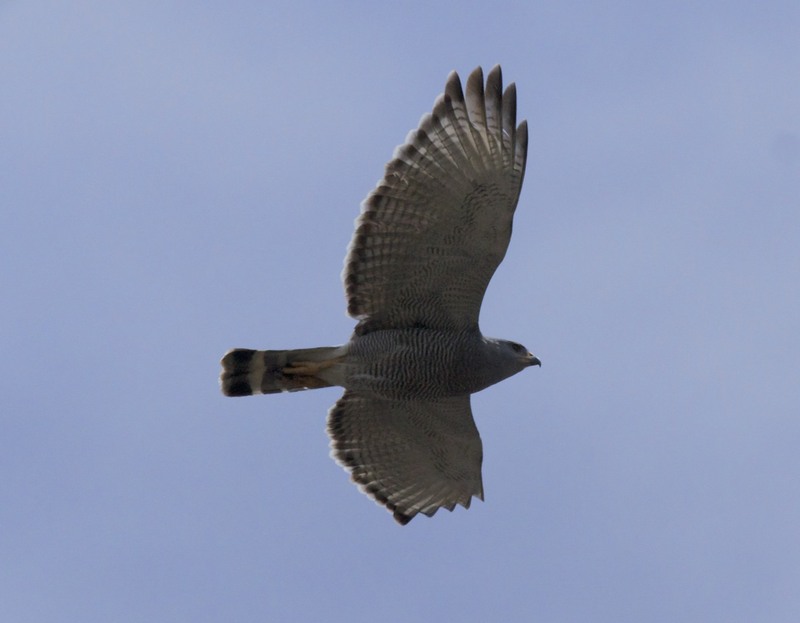 Not only did our raptor swing around for another pass, but it was joined by a buddy, and I was treated to the best looks and photos of Grey Hawks I've yet managed. Abiding traffic laws is for chumps (**I'm a chump 99.5% of the time). Getting to see these unique raptors was a real treat. They're basically hawks in evening suits, and they ooze more class than a Princeton course on viniculture attended entirely by Spanish aristocrats wearing french cologne and smoking Arturo Fuente cigars. 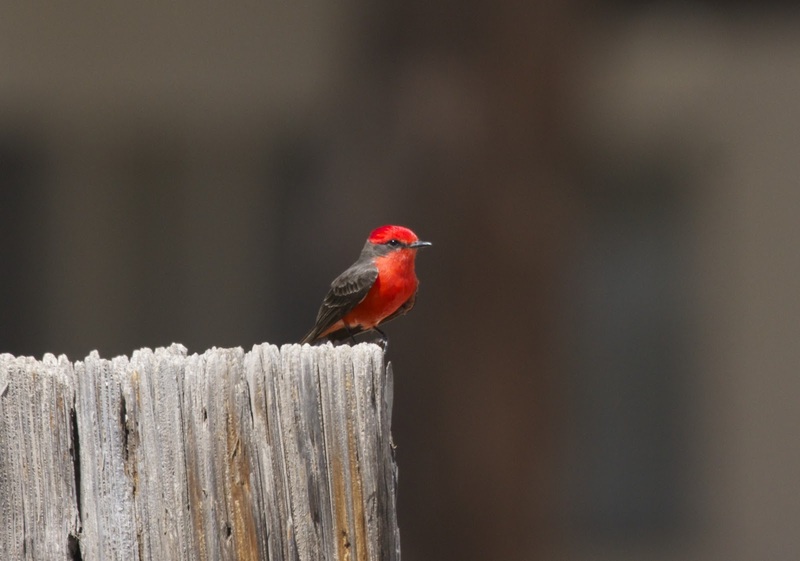 We got pinged by the somewhat steep entry fee for Patagonia, but as soon as we parked near the Sonoita Creek trailhead, east of the visitor center, we had more promising sightings. 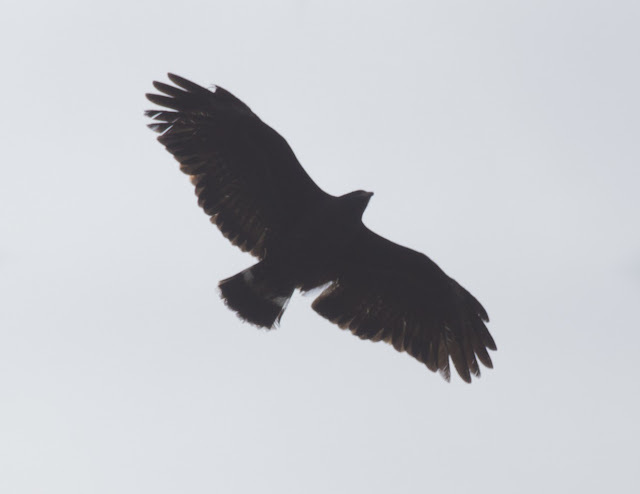 By soaring high in the cloudy skies and keeping the sunlight on his back, a Common Blackhawk did its very best to disguise itself as an ubiquitous Turkey Vulture. 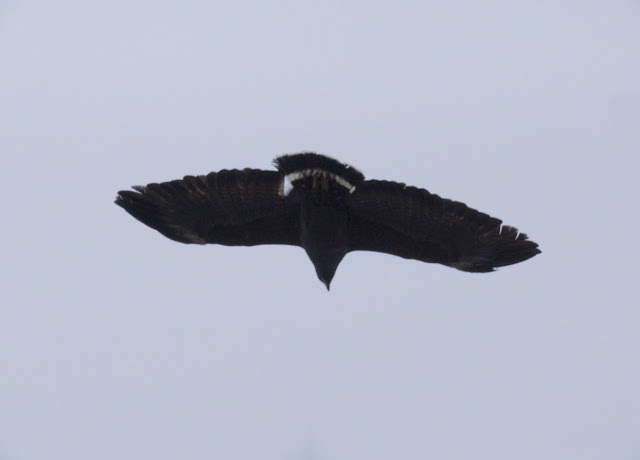 Silly Common Blackhawk...your wings are too fat, and your tail band is showing! The first portion of the Sonoita Creek winds through some mesquite bosque, which was particularly pleasant habitat with the recent rain softening and greening things up. In these low, scraggily trees lurked a potential lifer in the annual but ambiguous Black-capped Gnatcatcher. A male Black-capped Gnatcatcher can be told apart from the similar looking and sounding Blue-grays, but that would be just too easy. 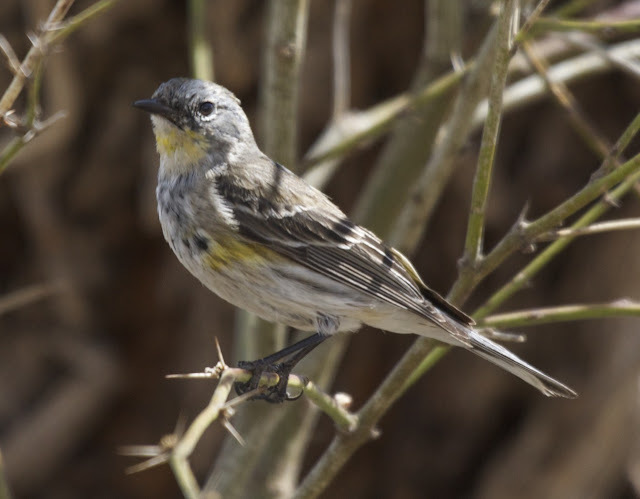 After checking out some Gray Flycatchers and other mesquite lovers, we heard a Gnatcatchery veeer, reminiscent but different from that of the Blue-gray. When we finally got some brief sightings of the bird, naturally it was backlit and clouded over, but I think we got enough to make the ID. Both female and male Black-capped Gnatcatchers have a proportionally longer beak and more graduated primaries on the tail, with a touch more black as well. It's hard to pick these plumage subtleties out in the field; luckily we got a few photos to examine in the dark room afterwards. 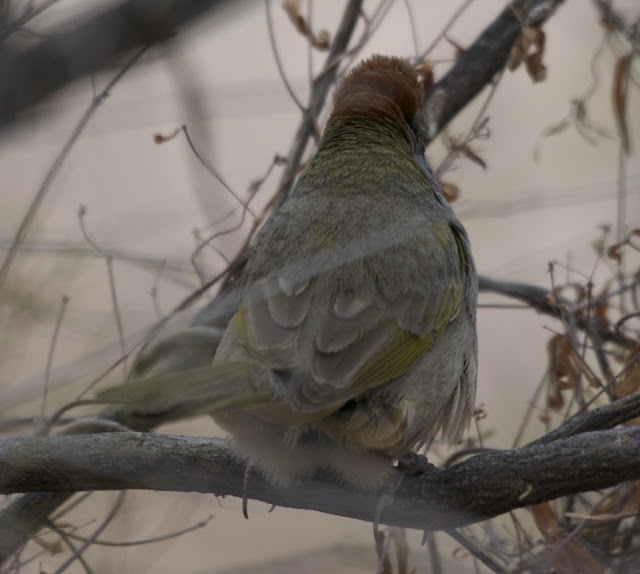 The Sonoita Creek trail and mesquite bosque open up to cottonwood riparian habitat as you head east of the lake, and here we had some more great birds such as Lucy's and Yellow Warbler, as well as Cassin's and Bell's Vireo. This certainly was not my nor Tommy's first time down the trail, and there were a half-dozen other birders in the area as well. 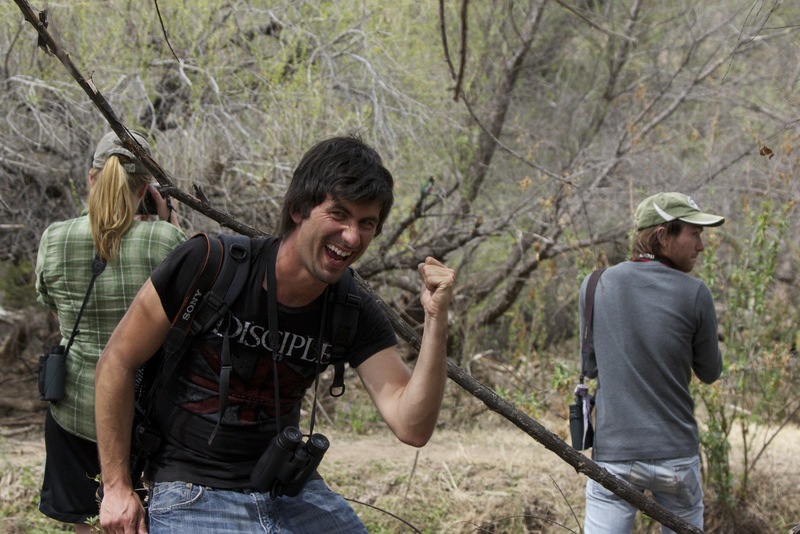 However, the most veteran explorer of Sonoita Creek was actually our other target for the site. 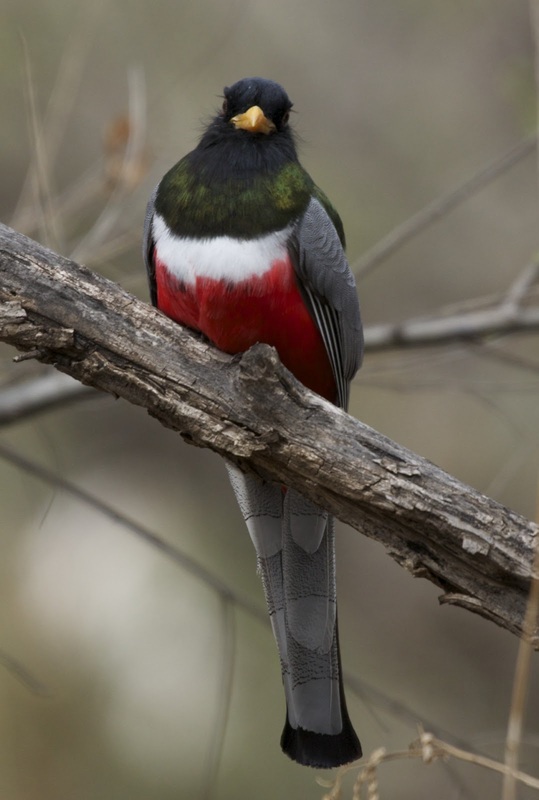 While most Elegant Trogons wait until later Spring and summer to really press north into Arizona, a single male Trogon was been wintering along Sonoita Creek since, allegedly, the late 1990s. 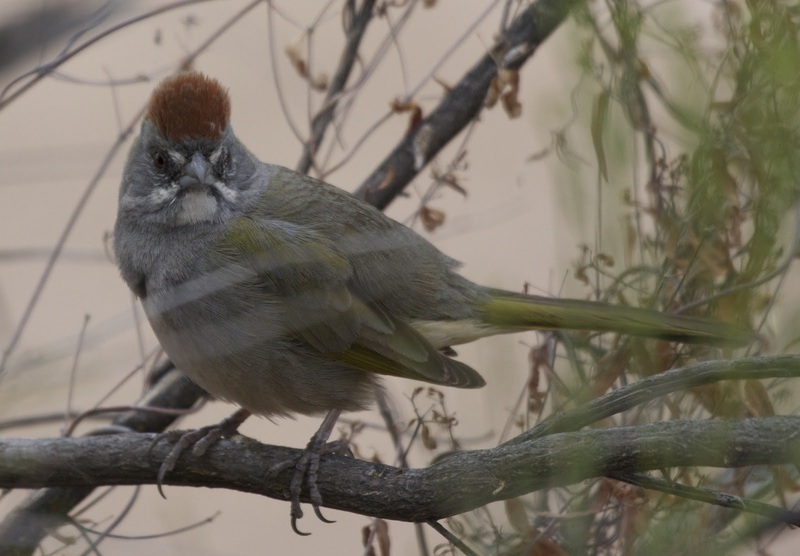 In a sense he's sort of the Pater Familias of all the other Arizona Trogons that have followed in his footsteps, exploring further north into the Santa Rita Mountains and elsewhere. The documentation of this individual bird is as extensive as it is impressive, and despite seeing Trogons elsewhere and visiting Patagonia many times, I'd never seen this particular bird. About a half-mile from the lake, down the Sonoita Creek Trail and hanging out in the mid-level scrub...that all changed. 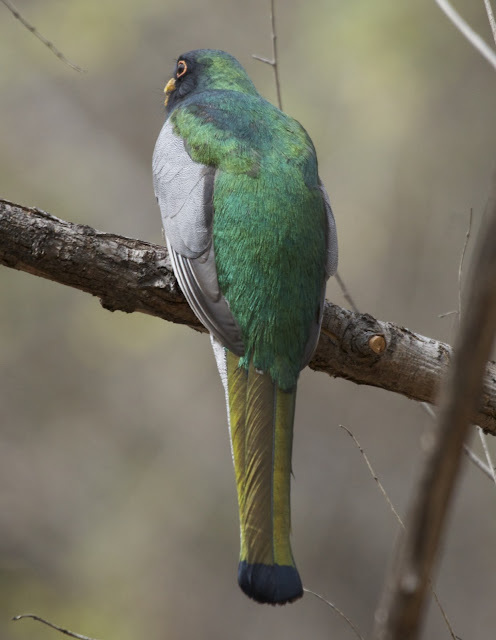 The brilliance of the male Elegant Trogon really can't be overstated. 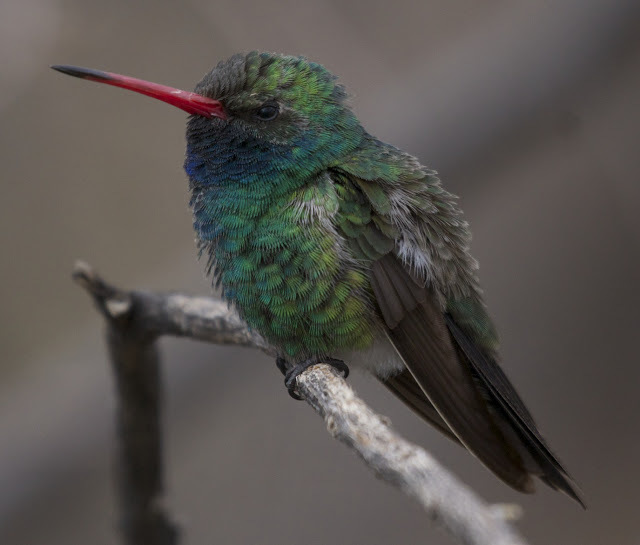 It is one of the most colorful, bodacious, and grandiose birds that occurs in North America. That doesn't make them easy to find either. 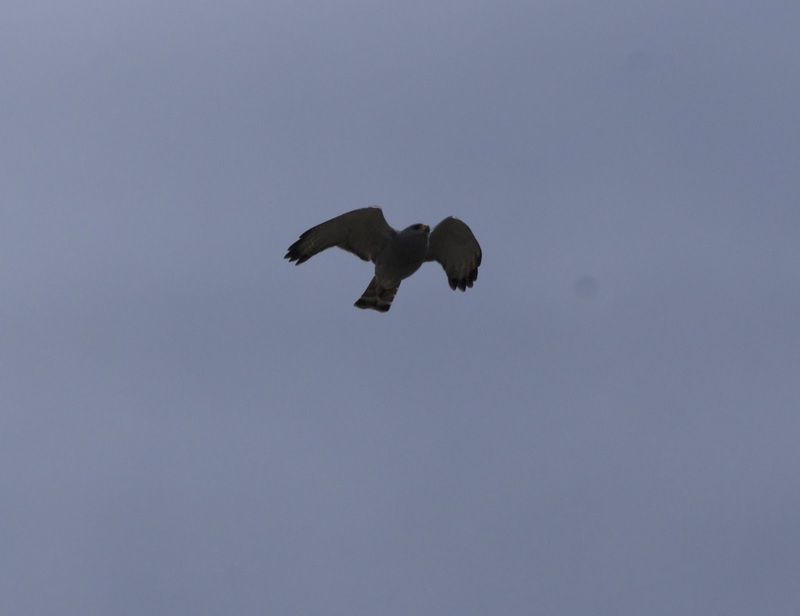 Especially in the winter/early spring months, when these birds are silent, it comes down to luck and persistence. Scanning scrubby tree after scrubby for that green and red...eventually we spied this fellow sitting perfectly still and perfectly comfortable. It was silent; it was stunning; it was surreal. Of course, we were only two of hundreds, even thousands of birders who have ogled this Trogon in the last dozen or more years, but that did nothing to dim the magnificence of the sighting, especially because in the silent wood, we were only twenty feet away from the bird, and we had it to ourselves. Unsurprisingly, this old fella was used to people. He patiently indulged us as we filled our memory cards with face melting images. He showed all his sides, including the resplendent, shimmering back, and even took a break to catch and eat a caterpillar during the shoot--the action of which I unfortunately missed, but here you can see a bit hanging out of his beak. It worked out splendidly well. We couldn't have asked for better looks of the bird, and we were close enough that the cloudy weather didn't corrupt the sharpness in the photos. It was just another day in the life for Mr. Trogon, but I daresay we were positively glowing. After getting our private session with the HIs Elegance, we then had the pleasure of being able to share the bird with some other birders passing through. There was an older couple who began recounting when they saw this very same (presumably) bird ten years before, a group of four younger birders (it feels weird saying that...) who started geeking out about it hard, and some folks visiting from Colorado who were not expecting such a sighting and were overjoyed. To be fair, we were expecting the sighting, and were also pretty ecstatic. Here's Tommy, with the Trogon in the background. The bird stayed so still, we could've taken family portraits with it. It was only early March, but bird sighting/experience of the 2013 year? Very probably. Still buzzed from the Trogon, we stumbled around Patagonia for another hour like drunken sailors aboard a drunken ship in an ocean of beer. 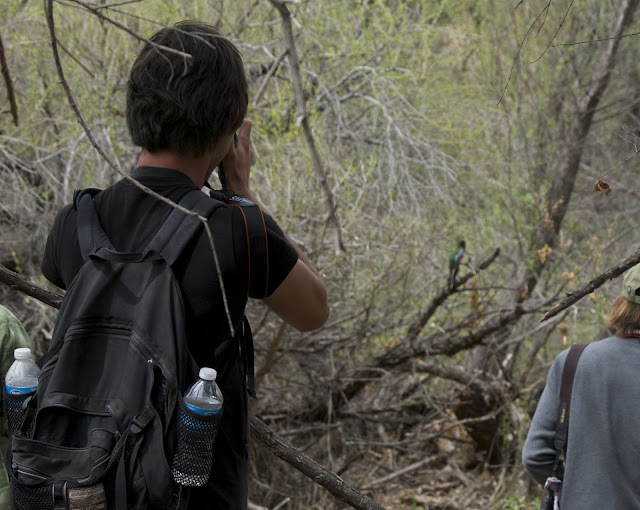 The Sonoita Creek trail yielded a few more cool birds, and we scanned the mesquite for further sightings of Black-capped Gnatcatcher, since we did not feel satisfied with our earlier sighting at the time. Eventually we decided to swing by the Patagonia visitor's center and then head north to the Santa Ritas. Much to my relief, the visitor center was open and had bathrooms. More pertinent to a bird blog, it also had Broad-billed Hummingbirds, along with a few White-throated Sparrows. Even around 2pm, it seemed like the birds were out and everyone was having a great day. But while the people and critters of Patagonia all enjoyed the cool weather and were generally congenial, one sour bird sat and moped, perhaps contemplating some past insult or plotting a revenge. Blarg! 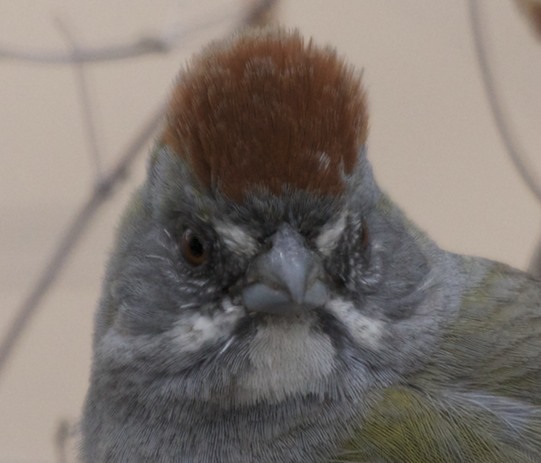 This was, without a doubt the grumpiest Green-tailed Towhee I have ever seen. Usually they're such chipper little birds, colorful on the outside and the inside. Not so with this misanthrope; he looked like that surly Internet Cat's best buddy, if crotchety animals can have best buddies. 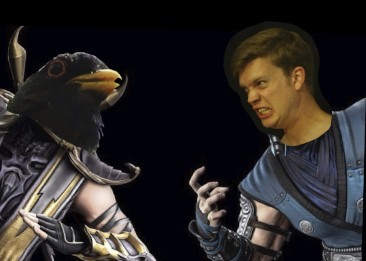 Before you ask, yes this bird haunted my dreams for weeks afterwards. It was too grumpy to even bother flying away. I was all smiles and taking photos, and it just kept staring and staring, letting the shame and loathing set in until I hung my head and backed away...backed away...backed away. The Green-tailed Towhee was a buzz-kill (not really), but once again Patagonia delivered with some the best birding I've yet experienced in 2013, and that was my feeling even before examining the Gnatcatcher photo too, so the life bird was just a bonus. I got to visit my best buddy the Trogon again, and see some other magnificent birds along the way. It was almost a lethal overdose of birding. Luckily this all occurred during my spring break week, and I didn't have to work again for several days. Upon returning to Phoenix I had severe withdrawal symptoms and was incapacitated for some time. Visit Patagonia but be careful. It will ruin you. Fantastic Laurence! And congrats again! It was exciting to read and I can only imagine the emotion. The shots are perfection. As for the Orioles. I would say, you got the rare one indeed. I'll trade him for the Bullock's and Scotts anyday! I'll also trade you one of my Spotted Owl sightings for one of your E.T. sightings:) I'm a bit exhausted and have cut back on the outings(as has Ms. Brown). The Scotts are in full gear right now down in Ash Canyon at Mary Jo's and at Battiste's place. In fact, today it was all Scott's Orioles everywhere. I don't know if you have stopped at these places, but they are really kind people. It's funny how it worked out with the Orioles. Like you said, their numbers are swelling down south. We just missed the first wave several weeks ago, and they haven't much made it up to the Phoenix area yet, but I'm thinking in a couple more weeks I shall have sweet, orange satisfaction. Every time I'm in the Huachuca's I swing by Mary Jo's. It makes me feel better after dipping on the Owls time after time. You crushed that trogon. Completely flattened it. Awesome...I've definitely dipped on that individual before. Thanks Seagull. It became a most delicious crepe afterwords. P.S. I'm a little surprised you're letting me get away with that Gnatcatcher!? I have no comment on the gnatcatcher except the bill doesnt look very long to me. Gnatcatcher retrice graduation is not something I'm well versed with. Well ok. It just wouldn't feel right if I didn't get my chops busted a little bit, buster brown. Consider them busted! Well, mildly anyways. And he could star as Grumpy Bird. hehe I fear that Towhee would've mauled us had we tarried even a minute longer. It was a super day. 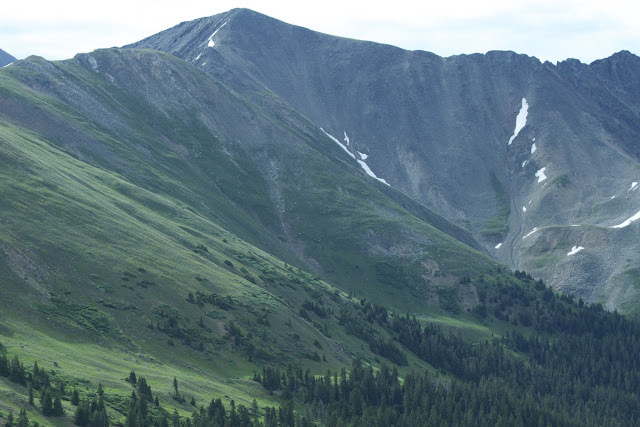 All in all, that photo of you in front of the Trogon may be my favorite. Thanks Tammy and hey that's a good point. The grumpy Towhee was, in fact, a tough-lovin' angel sent to make the eventual break-off from Patagonia easier. Great post and some great photos as well. 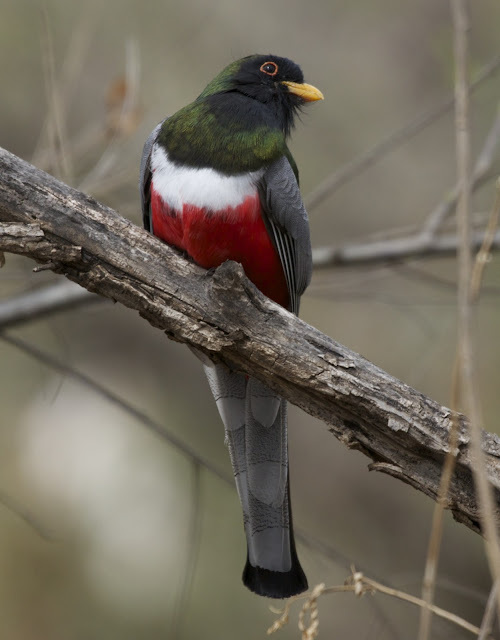 The Trogon photos are just awesome; and a bird I still have not had the pleasure to see. Just heard that it has left the area, so will now probably have to wait another year. Congrats on the all the great finds! We'll just have to head into Madera in July, and we'll have them then, with some Sulphur-bellied Flycatchers and stuff too. To the summer! On the Elegant Trogan photos and the Broad-billed Hummingbird, the feather detail is extraordinary - I keep seeing more and more - the different feather types and tracts, I could go on and on, but I won't. Back to the topic at wing, regarding colorful, bodacious, and grandiose birds, I will raise you a Northern Lapwing. The palette of colors have the same sort of shimmer. Most of the photos (online anyway) of the Northern Lapwing that graced New Egypt don't do the species justice, but it has the same mystic glow as your Elegant Trogan as it glides through killdeer and cow patties. But a clearly a gorgeous bird and lovely photos. I am glad you have cake too, sounds like a good weekend, especially if it's carrot-type. I'll give a vote of confidence to your Trogon, and truly there are few birds I'd prefer to see in North America to the Lapwing, but I dunno if it can out-class and out color the Trogon...I mean, Yellow-billed Magpie have that iridescence too. To really make this sure, we need to trade birds. Pawing for Trogon on a 1:1 trade. Funny that you should mention carrots. Cake is my symbolic carrot on a stick to encourage me to focus on my thesis writing. Bought it just for the occasion! Today was day 1 of writing. Eight hours spent staring at a computer thinking about birds rather than eight hours in the field looking for birds.. need to occasionally remind myself that it'll pay off when I get paid for birding and playing with birds, studying feathers, reading the latest research, making the newest discoveries (hopefully! ), and general outdoor frolicking ... so I would disagree and say it would be a life very well spent! For instance the red and blue pigments in cardinals and blue jays are achieved through very different processes. Oh my yes. 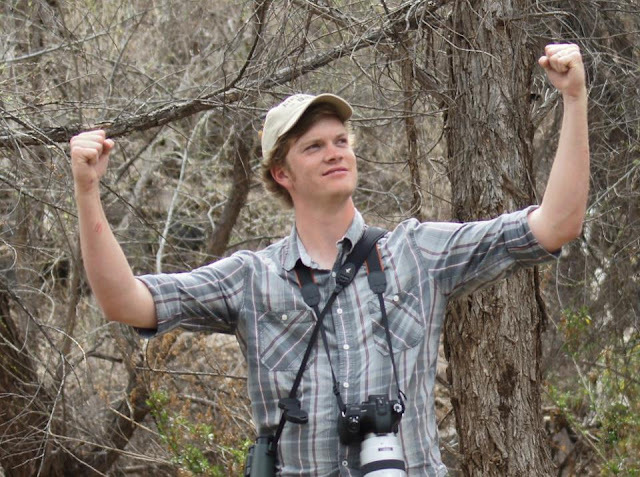 Getting paid for birding...now that is the ticket. I guess I should probably stockpile some other birds to for a big ol' trade. You mind getting some Wood Warblers and Harlequin Ducks as well? Where I work is supposed to be pretty good for warblers! and I am always game for a visit to The Chicken Or The Egg. What are you offering? Sparrows and Hummingbirds. Lots of them. I can also offer kestrel chicks. Great post and photos, love it there! Thanks Lillian. It's a great spot, very difficult to leave. Young birders! Best sighting of the day! 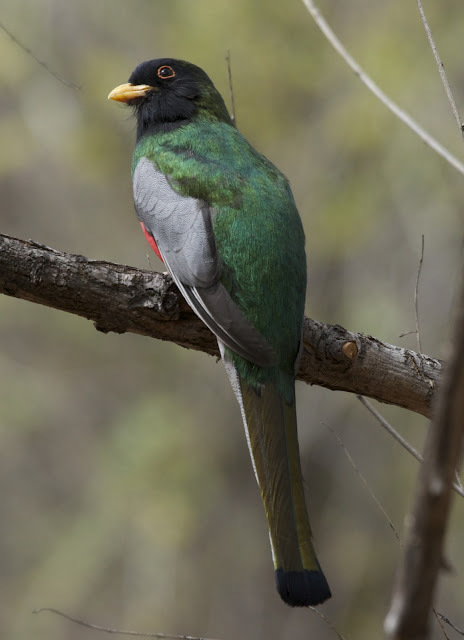 Trogon was pretty damn cool too. very jealous. Yeah, they got a little weirded out when I started studying their plumage and behavior with the nocs', but at least they didn't flush. Thanks Paul. It has been one of my goals in life to make a Canadian jealous (not an easy thing to do). Check! Fantastic! You absolutely annihilated that trogon. Looks like you guys were appropriately fired up about it. Of course, you also had to go and get the gnatcatcher that still eludes me. Freakin Arizona, man. Damn! Freakin' California man. I'll trade ya for a week, if you can handle living in the small city. Man, way to pack in some sweet stuff here... 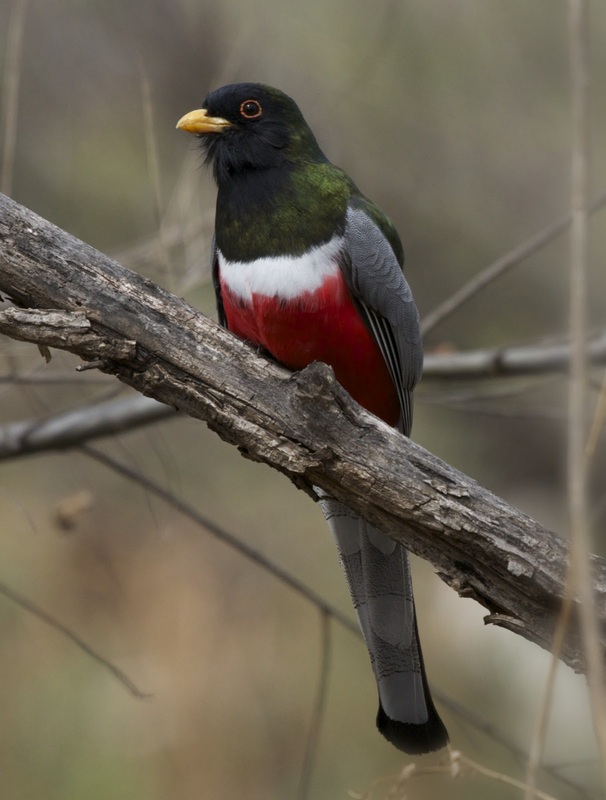 I forgot everything but the trogon. Seriously, high five. Yeah I'm probably done for the year now. Those Trogan images made my jaw drop and hit my desk top! Wow, what a handsome bird! Indeed Mia. Visiting there would be a crazy ride. Eventually we'll all overdoes and die tragically young, but at least we shall die as heroes. All photos posted here are property of Butler's Birds. Please ask before using. Simple theme. Powered by Blogger.